I think everyone has heard of Boston drivers. They are notorious. The Roommate, who hails from NH, once confirmed for me that up there, they can tell when a person is from Massachusetts by their driving. As mentioned above, Boston area drivers are not known for their courtesy or consideration for others around them. Pedestrians should use crosswalks and exercise considerable caution when crossing streets. Assume the drivers are *trying* to hit you. In that spirit, here is this week's WTF Boston? 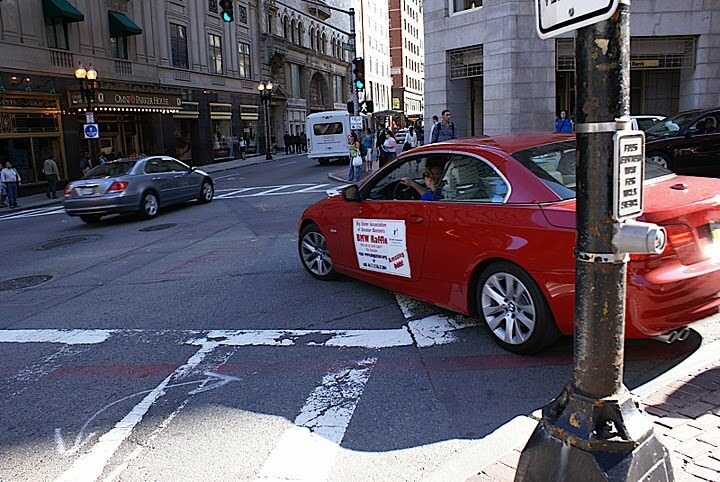 This pic was snapped by Sonal, the second time we saw a car (plus one motorcycle) driving on a sidewalk in Boston. This car was driving off a sidewalk on a corner of Tremont Street and School Street.